PronPack had an exhibition space at IATEFL 2018 in Brighton, sharing with others in the Independent Writers & Publishers Group. (Many thanks to Rob Howard for his hard work organizing this). Here’s Mark with Higor Cavalcante, first customer of the day, who is taking a set of the books back to Brazil. On the right is Oksana Hera from Ukraine, who we owe thanks to for being one of the reviewers of the PronPack manuscript. The large, colour version of the sound chart at the back of our display drew a lot of interest, as did the vowel chart T-shirts. 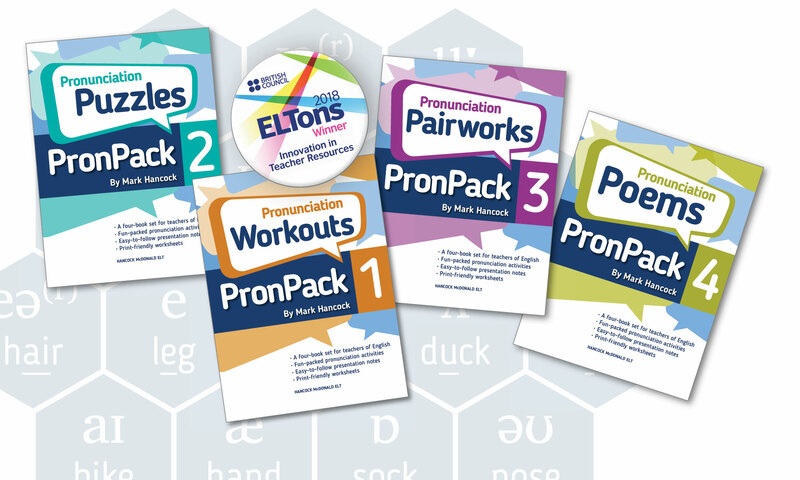 PronPack also made a showing on the PronSIG day of the conference, when the books were given out during the raffle, alongside Richard Cauldwell’s ‘A Syllabus for Listening – Decoding’. Previous PostPrevious What does ‘correct’ mean in pronunciation teaching?